Voting shouldn’t be chore. In fact, election day is a great way for a community to come together and build a stronger connection. As election day approached, we took on that charge to say: voting can be fun. 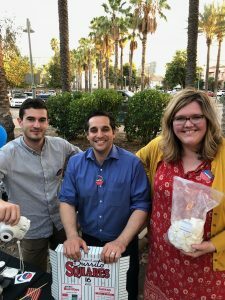 So, on election Day 2018, Burbank voters at the Buena Vista Public Library were greeted by a “Party at the Polls” hosted by Stratiscope in partnership with Civic Nation, local restaurants, and nonprofits. Stratiscope is a Burbank-based business that provides community intelligence services to organizations seeking to build stronger relationships with the communities in which they operate. As experts in building and activating community members, we made the polling place all about the people who came out to vote and those who happened to find themselves at the branch library. What does a party at the poll look like, you might ask? Think of a block party combined with a family backyard BBQ. City and community leaders stopped by to greet voters and offer them a reason to talk to each other. Voters and library patrons alike enjoyed music, food, and activities that made voting something to celebrate. Voters turned their “I Voted” stickers into buttons and a photo station allowed everyone — young and old alike — to get pictures taken with voting props and posters. There were activities for children and world music brought people to tap their toes and dance. The highlight may have been the food by local restaurants and bakeries that surprised attendees with burritos, cookies, empanadas, sweet treats and even a charcuterie table. The event was covered by ABC7, NBC4, and the LA Times (you can check out their photos here). A special thanks goes out to our partners in providing food and treats for the party… Poquito Mas, World Empanadas, Boulevard Kitchen, Plush Puffs, Martino’s Bakery, Grub, and Chef Michelle & Co.. Representatives from the Burbank YMCA also participated, adding to the fun of the day with giveaways and activities for families. And at Stratiscope, we made sure there was ice cream provided all day because realize it or not, ice cream brings people together. Ice cream gives neighbors an opportunity to stop for a moment, pause to enjoy something delicious, and make connections with other people. Voting is an opportunity to celebrate so many things, and voting as a community is an important aspect of the process. We look to future elections where neighbors can anticipate a true “party at the polls” that makes them look forward to voting. This shouldn’t be something to highlight; it should be the norm and expectation.